The Augsburg Paideia Program is pleased to offer scholarships to Minnesota K-12 teachers in order to support the pursuit of Paideia seminars in their classrooms. The Patricia F. Weiss Memorial Fund has been established in memory of a distinguished colleague and educator who devoted her career – first as a classroom teacher and later as a private consultant – to educational reform initiatives. Dr. Weiss worked closely with Mortimer J. Adler as a Paideia Associate and as the President of the Paideia Group, Inc. She was instrumental in nurturing the Augsburg Paideia Program from its inception in 1989 until her untimely death in 2012. As an Augsburg adjunct, associate professor Dr. Weiss provided training to teachers through the summer Paideia Institute. Because of her dedication to the Augsburg Paideia Program and summer institute, scholarships have been established to encourage Minnesota educators currently teaching in K-12 classrooms to seek initial or additional training in Paideia methodology. The scholarships will be used to defray part of the cost of attending the Paideia Institute. Scholarships will be awarded on the basis of the following criteria. Applicants must be 1) currently teaching in Minnesota K-12 classrooms and 2) willing to apply Paideia pedagogy with their students. An applicant statement expressing how the scholarship might be used to enhance professional development and student learning will be used to determine selection. The deadline for scholarship awards is May 1st for that year’s summer institute. For questions or to apply, email your applicant statement to Anne Kaufman at kaufman@augsburg.edu. The Augsburg Paideia Program is pleased to offer scholarships to Augsburg undergraduate or graduate students to attend the Paideia Institute in order to support the pursuit of learning through Paideia seminars. The Marie O. McNeff Memorial Fund has been established in memory of a distinguished colleague and educator who devoted her career to student learning and educational reform initiatives. 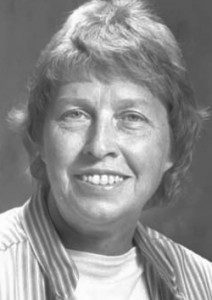 Dr. McNeff was instrumental in nurturing the Augsburg Paideia Program from its inception in 1989 until her untimely death in 1013. As an Augsburg professor in the Education Department for 27 years, her students referred to her with pride that they were one of “Marie’s students”. She continued as an academic leader as Vice President of Academic Affairs, Dean, and the Augsburg Board of Regents. Dr. McNeff provided mentoring to teachers through the summer Paideia Institute and onsite training. Because of her dedication to the Augsburg Paideia Program and summer institute, scholarships have been established to encourage Augsburg undergraduate and graduate students to seek initial or additional training in Paideia methodology. The scholarships will be used to defray part of the cost of attending the Paideia Institute. Scholarships will be awarded on the basis of the following criteria. Applicants must 1) be currently enrolled in as an Augsburg student in either an undergraduate or graduate program, and 2) complete an applicant statement expressing what they hope to achieve through Paideia that would enhance their learning and how they intend to utilize the knowledge and skills in their professional development. The deadline for scholarship awards is May 1st for that year’s summer institute. For questions or to apply, email your applicant statement to Anne Kaufman at kaufman@augsburg.edu.